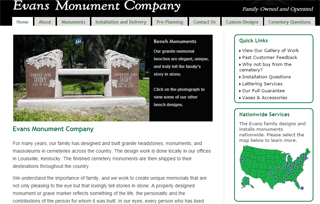 Provides custom design and building of granite monuments & headstones. Family owned and provides personal service for designing & installing monuments or headstones locally in KY or nationwide. Mausoleums and custom memorial monuments are designed and crafted by expert memorial designers to celebrate one’s life achievements in stone. The custom granite memorial bench designs are elegant, unique, and truly tell the family’s story in stone. Traditional stone memorial benches available also. The vertical monuments are usually a larger, more elegant designs that can mark an individual or family plot. They offer traditional monuments with two-piece headstones & space available for one to four family names or larger family estate vertical monuments with elegant designs. They also offer traditional monuments with two-piece headstones & space available for one to four family names or larger family estate vertical monuments with elegant designs.